On behalf of the Midwest Chapter of the Medical Library Association, the Wisconsin Health Science Library Association and the Southeastern Wisconsin Health Sciences Libraries Consortium, we invite you to Milwaukee for the upcoming Midwest Chapter/MLA 2019 Annual Meeting. 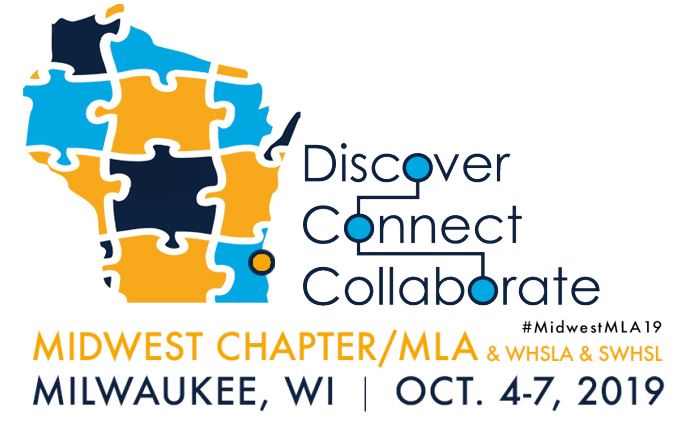 The meeting will be held October 4-7 at the Hyatt Regency Milwaukee where you will have the opportunity Discover, Connect and Collaborate with library leadership, librarians, and support staff who are coming from nine states across the Midwest. Exhibitors will have ample non-conflict time engage with conference attendees. The vendor opening reception will be held on Saturday evening, October 5, and exhibits will be open throughout the conference, Sunday October 6 – Monday, October 7. We have a new opportunity to engage this year: Exhibitor Showcase, where you can have the spotlight to highlight underutilized tools, or present new, upcoming products that would best help librarians/support staff or patrons do their work faster, easier, better! If you chose to participate, you will have approximately 5-10 minutes, (TBD) depending on the number of exhibitors who are interested in participation in the event to tell us about what you think is most important for us to know about your upcoming or current products. This exciting, new Exhibitor Showcase will be held on Monday during breakfast, from 7-8:30. Don’t miss your opportunity to have all eyes on you to showcase the most important things we need to know! Registration is now open, and we look forward to seeing you in 2019! There is a $25 fee for all cancellations.